Disclaimer: The Author does not accept any responsibility for the subsequent use of this information, for any errors or omissions that it may contain, or for any misunderstandings arising from it. NOTE: research conducted mainly in pre-1919 houses in England (i.e. with uninsulated solid brick walls). If a floor void is divided by sleeper wall foundations instead of piers, the void sections nearest the airbricks will be the coldest and best ventilated area. When a floor has such sleeper (dwarf) walls, it is likely that more heat is lost from the room above though the floor in this perimeter zone, near the air bricks. Hence installing insulation in this perimeter zone, could be a cost-effective way to reduce floor heatloss. This should be done all the way to the sleeper wall. Where there are no sleeper walls, perimeter insulation will have little effect and the whole floor should be insulated. Even with sleeper walls, insulating the entire underside of the floorboards will be effective. It is important that the insulation fits tightly against the underside of the floorboards and against the sides of the joists, and that all gaps, however small, are filled with insulation. This avoids thermal bypass, which can negate the effect of insulation. For this reason, flexible insulation is most suitable, unlike rigid insulation. Rigid insulation requires the deliberate cutting short of the boards and filling with foam: this is laborious, hard to do from above (so ideally done from the underside), and is less robust for future adaptations. Woodfibre insulation can be suitable, but messy; mineral wool insulations are suitable but not always vapour-open, considered an added benefit in floors due to potential /seasonal moisture build up. Sheeps wool is suitable, but moth infestations have been reported in some instances, notably where ‘chickenwire’ was used to suspend the insulation on the underside of joists. (and hence leaving it open to insects nesting). In any case, chickenwire applications do not improve floor airtightness, so draughts are likely to occur still, despite insulation addition. Ensure to use products which do not off-gas or affect human health, this is especially the case with many sprayable products. Ensure they are inert. Also ensure that electricity cables and other services do not become ‘cast’ in sprayed insulation as this will reduce adaptability and maintenance later on. (And in the case of old electricity cables, the plastic wiring can interact with EPS and increase the fire risk). Water and radiator pipes in the void should also be insulated, with no gaps in the insulation sleeves as this can become a surface for condensation, contributing to moisture issues in the void. Uninsulated warm pipes not only lose heat in the void, but in an uninsulated void (which is now colder because less heat is lost from the floor above), the pipe heatloss would increase and could increase mould growth risk by warming the void; hence these pipes must be insulated or moved to the heated areas of the building, i.e. above the floor. Underfloor heating systems should never be installed without also significant insulation of the floor, including the joists, otherwise the underfloor heating is mainly ‘conditioning’ (i.e warming up) the void, instead of the room and its occupants. In an uninsulated floor, the floor joists add additional thermal resistance, but once the floor is insulated (typically by installing insulation between the joists), the joists become a thermal bridge compared to the now better insulated floorboards. Ideally insulation is also installed under the joists, especially in the perimeter region where there are sleeper walls. This can be done as an additional layer of insulation after insulating in between joists. Filling the void with EPS beads is very effective given that also the airtightness is improved by sealing the airbricks, and was measured to reduce floor heat loss by 92% in one case study. However most installers do not give warranty due to the risk of sealing airbricks and the potential risk for mould growth or timber rot in the void over time, due to the sealing of the airbricks and potential risk of moisture build-up in the void. There has not been much evidence of this risk in the UK, however the absence of evidence does not indicate absence of risk, so the pre-cautionary principle applies. Simple RH and temperature sensors could be used (e.g. here) to monitor the void conditions to ensure that the moisture build up is detected timely (≥ 80% RH), and the insulation could be removed to enable ventilation. It is thought that even with good airbrick ventilation, its function is mainly for preventing timber rot at the joist ends where the joists sit in the external wall. Mould and time rot do not grow as fast in changing conditions, as found in floor voids, and air flow ensures unstable conditions. There is little evidence of airflow patterns in voids, but it appears that the ventilation might be limited locally to the airbrick locations, rater than cross ventilate a whole floor - this is the case especially with sleeper walls obstructing the cross flow. In any case the recommendation is to not obstruct or seal airbricks permanently (see below for temporary sealing); however if there is a significant moisture problem (e.g. leaking services above, a leaky rainwater pipe spilling water into the void etc), the airbricks would likely be insufficient to dissipate the moisture build up to avoid mould growth and timber rot. Aside from any structural damage, mould spores have been known to transfer to places above, affecting human health. Before insulating floors, the floor void should be inspected to ensure no moisture issues exist, and if they do, this needs to be rectified first. Moisture evaporation from the ground can be managed by placing sheeting over the ground. If a history of dampness, it is recommended that the void is monitored (RH/temp sensors) and inspected over time. For DIY methods, ‘chicken wire' is often used to suspend insulation, but this often leads to a lack of a tight fit of the insulation and the underside of the floorboards and cold air can still penetrate the (often loose fill) insulation, reducing the insulation value (and reducing any thermal comfort impact). Any membranes should be tightly stretched and overlapped to avoid any air gaps. Ideally skirting boards are removed and the membrane wrapped up against the wall before replacing the skirting board. Likewise about sealing around services that penetrate the floor. A vapour permeable airtightness membrane can be overlaid on top of the joists (and behind the skirtings), instead of below the joists to suspend insulation in. However, placing the vapour-open airtightness membrane below the insulation is superior as it prevents air penetrating the insulation and avoids reducing its efficacy. There is also a danger that a membrane above makes the tight fitting between insulation and underside of the floorboard difficult, creating gaps. The presence of membranes could create issues with moisiture built-up in the insulation/joist zone from (hopefully, rare) water spillages above. However the placing of a membrane needs to be weighed against having worse airtightness, greater difficulty to hold insulation in place, versus potential moisture build-up. During winter, the majority of heatloss is driven by cold air coming into the void from outside. This can be controlled by temporarily and intelligently sealing air bricks, with an intelligent airbrick system, which remains closed, unless the void conditions indicate moisture build up. (see E.g. Airex). It should be noted that insulating floors should positively affect occupant thermal comfort. However, research has not conclusively shown this is the case: while surface temperatures become warmer after insulation, they are still significantly below the ideal comfort temperatures for bare feet (19ºC). If you cannot insulate the floor, a thick carpet with good rubber underlay can reduce floor heatloss by up to 20%, compared to uninsulated floorboards (based on 1 study). Radiant barriers (foil on its own or foil backed insulation) also reduces radiant heat loss, however its efficacy over time reduces due to dust build up on the shiny foil. When undertaking any innovative method, it is advisable to monitor the floor for damp signs over time; several years are likely to be needed, particularly in a changing climate where an unusually wet season can suddenly cause problems where there were none before, in both insulated and uninsulated structures. If enough space below the joists, work could be undertaken from below, however health and safety and the difficulty of working in a confined , dark and dusty space means that often it is easier, quicker and safer to take-up the floorboards to insulate. Only in basements where one can stand, is working from below easier. Approximately a 20 m2 room can be done in a day by two fitters with experience (taking up boards (number them to put back in place correctly! ), breather membrane stapling over and under joists, insulating pipework in the void, and installing flexible insulation; relaying boards). Note this is based on the material being in place and the room was already emptied. This also excludes airtightness measures such as lifting the skirting boards nor any repair or replacement of e.g. damp joist and fixing leaks etc. Usually this is done in sections, based on the sleeper walls and to make it easy to work in the room. This research was funded by the EPSRC Centre for Doctoral Training in Energy Demand (LoLo), grant numbers EP/L01517X/1 and EP/H009612/1 while the corresponding author was at UCL. The authors are also very grateful for the support of: the Belgian Chair Charity Fund administered by the Embassy of Belgium in London, to the homeowners for access to the case study houses and to Salford City West Housing Association, Carbon Co-op, NBT, Knauf, Energy Savings Trust and Downs Energy for support of the studies at different stages. Reducing space heating energy demand supports the UK’s legislated carbon emission reduction targets and requires the effective characterisation of the UK’s existing housing stock to facilitate retrofitting decision-making. Approximately 6.6 million UK dwellings pre-date 1919 and are predominantly of suspended timber ground floor construction, the thermal performance of which has not been extensively investigated. This paper examines suspended timber ground floor heat-flow by presenting high resolution in-situ heat-flux measurements undertaken in a case study house at 15 point locations on the floor. The results highlight significant variability in observed heat-flow: point U-values range from 0.56 ± 0.05 to 1.18 ± 0.11 Wm−2 K−1. This highlights that observing only a few measurements is unlikely to be representative of the whole floor heat-flow and the extrapolation from such point values to whole floor U-value estimates could lead to its over- or under- estimation. Floor U-value models appear to underestimate the actual measured floor U-value in this case study. This paper highlights the care with which in-situ heat-flux measuring must be undertaken to enable comparison with models, literature and between studies and the findings support the unique, high-resolution in-situ monitoring methodology used in this study for further research in this area. There are approximately 6.6 million dwellings in the UK built before 1919, predominantly constructed with suspended timber ground floors whose thermal performance has not been extensively investigated. 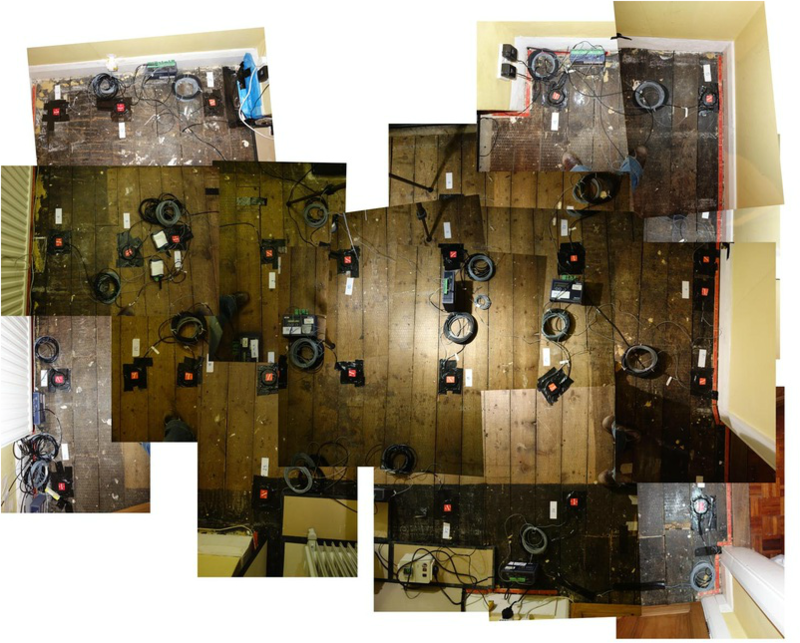 The results are presented from an in-situ heat-flow measuring campaign conducted at 27 locations on a suspended timber ground floor, and the estimated whole-floor U-value compared with modelled results. Findings highlight a significant variability in heat flow, with increased heat loss near the external perimeter. In-situ measured-point U-values ranged from 0.54 ± 0.09 Wm−2 K−1, when away from the external wall perimeter, to nearly four times as high (2.04 ± 0.21 Wm−2 K−1) when near the perimeter. The results highlight the fact that observing only a few measurements is likely to bias any attempts to derive a whole-floor U-value, which was estimated to be 1.04 ± 0.12 Wm−2 K−1and nearly twice that derived from current models. This raises questions about the validity of using such models in housing stock models to inform retrofit decision-making and space-heating-reduction interventions. If this disparity between models and measurements exists in the wider stock, a reappraisal of the performance of suspended timber ground floors and heat-loss-reduction potential through this element will be required to support the UK’s carbon-emission-reduction targets. There are approximately 10 million suspended timber ground floor constructions in the UK and millions more globally. However, it is unknown how many of these floors are insulated and their performance has not been widely investigated. This study investigates the impact of retrofitting insulation on the thermal performance of suspended timber ground floors through the detailed investigation of a UK case study dwelling. Practical and buildable interventions were undertaken: fully-filling the floor void with EPS beads, and 100 mm woodfibre insulation between the joists. The performance of both interventions was monitored by high-resolution in-situ heat-flow monitoring in 27 floor locations, allowing for comparison with the uninsulated floor and with modelled results. While floors often remain uninsulated due to the disruption of retrospective works, this study highlighted potentially significant heat loss reductions: the mean whole floor U-value dropped by 65% for woodfibre insulation and 92% for bead-insulation which also benefited from sealed airbricks. A disparity between the in-situ measured and modelled performance was observed; this gap reduced the better insulated the floor was. The findings have implications for policy, retrofit decision-making and carbon emission reduction stock models, especially given the modelled underestimation of floor heat loss, impact of interventions and assumed financial payback for this study. Pelsmakers, S., Vereecken E., Airaksinen, M., Elwell, C.A. Purpose: Millions of properties have suspended timber ground floors globally, with around 10 million in the UK alone. However, it is unknown what the floor void conditions are, nor the effect of insulating such floors. Upgrading floors changes the void conditions, which might increase or decrease moisture build-up and mould and fungal growth. This paper provides a review of the current global evidence and presents the results of in-situ monitoring of 15 UK floor voids. Research method: An extensive literature review on the moisture behaviour in both uninsulated and insulated suspended timber crawl spaces is supplemented with primary data of a monitoring campaign during different periods between 2012 to 2015. Air temperature and relative humidity sensors were placed in different floor void locations. Where possible, crawl spaces were visually inspected. Implications: Comparison of void conditions to mould growth thresholds highlights that a large number of the monitored floor voids might exceed the critical ranges for mould growth, leading to potential occupant health impacts if mould spores transfer into living spaces above. A direct comparison could not be made between insulated and uninsulated floors in the sample due to non-random sampling and because the insulated floors included historically damp floors. The study also highlighted that long-term monitoring over all seasons and high-resolution monitoring and inspection are required; conditions in one location are not representative of conditions in other locations. Value: This study presents the largest UK sample of monitored floors, evaluated using a review of current evidence and comparison with literature thresholds.